HOUSTON (AP) — Although he was born and grew up on the East Coast, former President George H.W. Bush was the quintessential Texan. He found early success in the state’s oil fields, helped change the landscape of Texas politics and loved Tex-Mex food. And in his adopted hometown of Houston, Bush, who died on Friday, and his wife Barbara endeared themselves to the city and its residents through their kindness, accessibility and support of charitable causes and local sports teams. “His roots are here and he’s considered a Texan even if he doesn’t have the accent,” said Jim Granato, executive director of the University of Houston’s Hobby School of Public Affairs. Bush didn’t come to Texas until 1948, after he had served in World War II and graduated from Yale University. Along with his wife and their young son George W., the family came to live in Odessa. Bush took a job as an equipment clerk for the International Derrick and Equipment Co. He eventually achieved success in the oil business, forming Zapata Petroleum Corp. In 1958, Bush and his family moved to Houston, where he began planting the seeds of a political career that would help change the face of Texas politics, which at that time was dominated by the Democratic Party. In 1963, Bush was elected chairman of the Republican Party in Harris County, where Houston is located. He unsuccessfully ran for a U.S. Senate seat in 1964 before being elected to the U.S. House of Representatives in 1966. Bush was the first Republican to represent Houston in Congress. He won re-election two years later. After a second unsuccessful bid for the U.S. Senate in 1970, Bush served in various positions in the federal government, ultimately serving as vice president and later president in 1989. But Texas and Houston were never far from his mind. Molina said when Bush was president his restaurant would periodically ship food to the White House. “That would happen whenever the mood hit him,” Molina said. After his time as president, Bush and his wife, who died in April, returned to Houston, where they became fixtures at Astros games and other sporting events. During Sunday’s NFL game in Houston between the Texans and Cleveland, Bush was remembered with a moment of silence. The Bushes also supported various local charitable causes and fundraising campaigns for organizations, including the University of Texas M.D. Anderson Cancer Center. “The Bushes could have moved anywhere after his time in public office, but they chose to return to their beloved city where he started his political career,” said Houston Mayor Sylvester Turner. 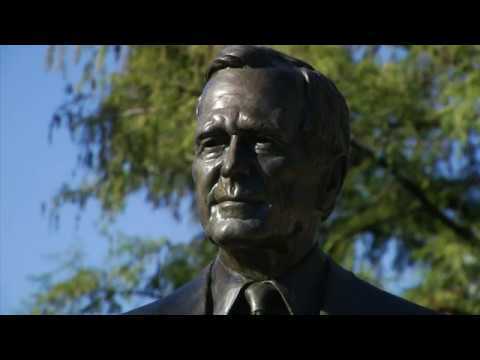 While Houston’s largest airport, as well as a park and an area high school have been named after him, residents say Bush solidified his place in their hearts through his humility and easygoing nature. During Sunday Mass at his longtime church, St. Martin’s Episcopal, Bush’s pastor, the Rev. Russell J. Levenson Jr., acknowledged the former president’s death but told parishioners that Bush would have wanted the attention not focused on him but on the church service. “He’d take a moment just to shake your hand. He’d remember people’s names and that was something that really surprised our staff, that he would remember them and was real open with them. It was great,” Molina said.